Stones visited in the Scottish Borders region, listed by Ordnance Survey 1:50,000 Landranger Series map coverage. Click here Ordnance Survey Explorer 1:25,000 Series. 027 Standing Stone, Gogar, Edinburgh. 028 Inscribed Stones, Tormain Hill, Ratho. 029 Witchis Stane, Platt Hill, Ratho. 035 Standing Stone, Galabraes, Bathgate. 037 Justice Stone, Hopetoun Wood, Queensferry. 038 Boundary Stone, Witch Craig, Torphichen. 041 Standing Stone, Gormyre, Torphichen. 042 Cromwell's Stone, Harburnhead, West Calder. 051 Boar Stone, Barbachlaw, Armadale. 052 Standing Stone, Hillhouse, Torphichen. 053 Refuge Stone, Torphichen Preceptory. 054 Refuge Stone, Westfield, Torphichen. 002 King's Chair, Gullane Hill, Gullane. 010 Boar Stone, Prora, North Berwick. 016 Custom Stone, George Hotel, Haddington. 019 Stone, Holyrood Park, Edinburgh. 023 Hanging Stones, Braid Road, Edinburgh. 025 Standing Stone, Ravenswood Ave, Edinburgh. 026 Cat Stane, Inch, Edinburgh. 030 Standing Stone, Cammo, Edinburgh. 031 Standing Stone, Niddrie House, Edinburgh. 032 Standing Stone, Wright's Houses, Gorebridge. 034 Gowk Stone, Auchencorth, Penicuik. 044 Standing Stone, Newhouse, Ratho. 045 Stone, St. Anthony's Well, Edinburgh. 046 Johnnie Moat Stone, Prestonpans. 058 The Slidey Stane, Holyrood Park, Edinburgh. 004 Standing Stone, Standingstone, East Linton. 007 Crow Stones, Nine Stone Rig, Cranshaws. 008 Stone, Crow Moss, Cranshaws. 009 Stones, Kingside Hill, Cranshaws. 012 Packman's Grave, Whiteadder Reservoir. 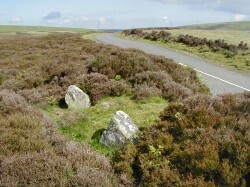 013 Stone Circle, Nine Stone Rig, Cranshaws. 014 Maiden Stone, Traprain Law, East Linton. 015 Loth Stone, Cairndinnis, East Linton. 017 Stone Circle, Yadlee, Cranshaws. 018 Stone Circle, Kingside Hill, Cranshaws. 043 Stone, Aberlady Bay, Aberlady. 048 Chapel Stone, Penshiel, Cranshaws. 049 Stone Circle, Penshiel, Cranshaws. 055 Stones, Ragstone Rig, Cranshaws. 056 Stones, Bothwell Water, Cranshaws. 057 Stone, Bothwell Water, Cranshaws.